The unfolding disaster in Fukushima, Japan and the 25th Anniversary of the Chernobyl disaster in the former Soviet Union lead World without Wars and Violence to declare its position regarding Nuclear Energy1. As humanists, we put human life as the central value, we are in favour of development and technology, and we must learn from those disasters that have occurred in the development of technology and industry so that we do not repeat them again in the future. Radioactivity is not a man-made phenomenon, yet human activity since 1945 has constantly raised the level of radioactivity in the environment leading to unknown numbers of cancers and deaths. Although medical science is not in agreement on all the details, it is beyond doubt that radioactivity is bad for life. When the body is subjected to the effects of ionising radiation such as those found in radioactive elements, the body’s cells start to break down which, in the most severe cases, leads to cancers and the failures of organic systems essential for life. Whereas medical researchers (and those who fund them) argue over how much radiation is acceptable on a daily basis, it is accepted that the damage caused by exposure to radiation is cumulative and such damage does not always manifest itself immediately, making it impossible to attribute the cause of cancer to any one event alone. Nuclear power plant operators are unable to deal with the waste products they generate. The by-products of uranium and plutonium fission stay radioactive for millennia. Scientific research has been unable to find a way to speed up radioactive decay processes so that unstable elements decay quickly to stable elements. Countries and operators have built their plants in geographically seismic regions and in coastal regions where they are susceptible to freak tsunamis. Incidents can never be completely eliminated and terrorism is too great a danger. Since nuclear power started there have been hundreds of releases of radioactivity into the environment, including the major events of Three Mile Island, Chernobyl and now Fukushima. Given that radioactive materials will be with us for thousands of years, if incidents keep on happening with the same frequency, the entire biosphere will be too toxic for life within a few centuries. Nuclear power facilities cannot be built without government assistance. Currently in the USA the only way funding for new nuclear power stations can be achieved is with government guarantees. Insurance companies will not give insurance because the potential for disaster is too great. US government subsidies support the construction process, they support operating costs through subsidies to the mining and uranium enriching industries and they support water and security costs, they support the costs of nuclear waste management and finally they support the decommissioning costs. All of this is paid for by tax payers so that operators may make a profit and pay shareholders. If all of these costs were included in the cost of the electricity generated it would end up being the most expensive way imaginable of boiling water to turn electricity turbines. In the same way that the coal power stations have to include the costs of carbon emissions and pollution costs, so the nuclear power industry should cover their own costs. Only in this way can the supposed market forces—the bible of today’s economics—work properly to get rid of this energy source. There is an assumption that the planet can continue to consume energy at an accelerating rate for the rest of eternity, and there is a belief, actively-promoted by the nuclear industry, that nuclear energy of the sort generated today is capable of meeting this requirement. It is widely accepted that there is probably no more than 100 years supply of fossil fuels left. It is also known that solar energy, wind, hydro-electric, geo-thermal and tidal energy are available sources that don’t create carbon emissions once operational. These energy sources also have the added advantage that they don’t create waste products that cause security and health risks for the planet for several millennia. A truly global, humanist and intelligent approach to meeting the planet’s energy needs is to invest as much as we can afford into exploiting these energy resources. Clearly this means vast reductions in the military budget to meet such investment. In addition, the planet needs to invest in energy efficiency such as insulation and energy efficient appliances so that demand for energy reduces. Nuclear reactors were first built to create plutonium for nuclear weapons, the generation of electricity was seen as a way to subsidise the process. The process of obtaining plutonium from uranium is straightforward enough to make any country capable of generating nuclear energy, also capable of producing plutonium for weapons. Nuclear power plants—even were we to accept that they were designed for altruistic purposes of providing cheap energy—become military targets in times of war and are always terrorist targets in a world with such social injustice. When attacked by conventional bombs or a 9/11 style attack, although an explosion of the sort experienced in Hiroshima and Nagasaki is unlikely, the distribution of radiation around the planet would have consequences far greater than those experienced then and later on in Chernobyl. The Non-Proliferation Treaty was designed to achieve nuclear disarmament, prevent proliferation and allow member states to pursue peaceful uses of nuclear technology. Clearly it has failed in its mandate; there has been no disarmament and there are now four nations (Israel, India, Pakistan and North Korea) possessing nuclear weapons and not belonging to the NPT. To achieve this all of these nations have been assisted by one or more Nuclear Weapon State in contravention of the treaty. Iran, who is a signatory to the NPT, is treated as some kind of pariah state and threatened with war as it pursues its goal of creating a nuclear power station – as is Iran’s right under the NPT agreement. The International Atomic Energy Agency was established in 1957 to promote the peaceful uses of nuclear energy and has since been endowed as the promoter and regulator of nuclear technology – a situation that, were it to happen in other industries, would be denounced as undemocratic. In addition the World Health Organisation has a written agreement with the IAEA to the intent that no report on the subject of radiation can be written by the WHO without prior approval by the IAEA. Although our primary focus is the end of wars and violence, recent events in Japan have once again shown that we live in an interconnected world and something happening on one side of the planet can have dire consequences for people on the other side of it. When one nation is capable of poisoning the entire planet, the consequences are a form of violence that we cannot remain silent about. Therefore World without Wars and Violence strongly opposes the use of nuclear energy by fission as a means to meet the energy needs of the planet and we call for an end to fission-driven nuclear power as soon as it is technically feasible. We call for an immediate moratorium on new nuclear power facilities: those in the process of being built should be stopped and all those in the planning stages should be scrapped. We are not naïve, and recognise that existing nuclear facilities cannot be turned off overnight. Nevertheless we call on all nations of the world to make plans to phase out their existing nuclear facilities within ten years. All those nations with nuclear waste must invest in secure storage facilities in seismically inactive zones of the planet where all radioactive materials may be stored until science has discovered a way of safely removing radioactivity from radioactive substances. Global cooperation and financial support must be made available for those countries unable to finance these costs. We call for vastly increased global cooperation in the field of renewable energy and we support the existence of the International Renewable Energy Agency (IRENA) with its headquarters in the United Arab Emirates and call for it to be given a budget to enable it to do its job effectively. We call on all nations that have not yet signed or ratified the IRENA statute to do so and we call for progressive and proportional reductions in military spending to fund research, development and implementation of renewable energy schemes. We demand nuclear and radiological weapons to be eradicated from the face of the planet, and for all fissile materials for weapons to be mixed back into the waste products of nuclear power so that they may not be readily re-assembled into new weapons. All nations must take collective responsibility for the security of radioactive materials so that they may never fall into the hands of terrorists. We call for criminal charges to be brought against the executives of TEPCO and those members of the Japanese Government who are responsible for the inability of the Fukushima power station to cope with the tsunami that knocked out its backup power systems. It is criminally negligent to build nuclear power stations in earthquake and tsunami zones. In the light of Fukushima, we believe it is urgent that the planet wakes up from its ignorance of the danger it is facing from nuclear energy and the danger it faces from refusing to invest everything it can, now, in renewable sources of energy. We denounce those who promote nuclear energy as a clean and cheap source of energy (we have shown that it is neither). We in World without Wars and Violence are in favour of the development of science and we do not oppose research into nuclear technology and we believe that more research into nuclear fusion will result in interesting future possibilities for humanity. Also we are not calling for an end to small-scale reactors that are used to prepare medical isotopes. Understanding that the environment must be taken care of, as in other matters, we consider that scientific development should be at the service of human beings alive today and future generations, and not at the service of economic, military and political interests. There is a crisis in the field of nuclear fission; it is exhausted by insecurity, contamination, economic cost, uncontrollable in certain circumstances and with clear connections to an industry responsible for producing the most murderous and destructive weapons in human history. There is no doubt that the way of nuclear fission must be closed. Human society has been built on an industrial revolution powered by gas, coal and oil. Today’s fission-based nuclear technology is not the replacement for these energy sources, which must be phased out, partly because they will run out in a few generations, but also because of the dangers of climate change. If humanity fails in its task, and we do not address the energy needs of the planet, it will take the planet hundreds of millions of years to rebuild its carbon stocks to allow a future industrial revolution to take place. The decisions to be taken by today’s politicians and today’s citizens will affect not only our children and grand-children; they will ultimately affect the survival of the human species and all life on the planet. In the meantime we give our total backing to forms of energy that are non-contaminating, that don’t leave waste, that are respectful of the environment and above all not aggressive towards human beings. As Einstein said, "Technological progress is like an axe in the hands of a pathological criminal." Let us take the axe out of the hands of this violent, consumerist and military system and build a new system based on the value of human life as the central value, to transform the criminal one we currently live in. In our position we are specifically referring to the nuclear energy generated through processes of nuclear fission (splitting of atoms) used in every one of the 442 power stations scattered around the world. Physicists believe it is theoretically possible to generate nuclear energy through the fusion (or joining together) of atoms and we are in favour of research in this field. The works of Silo in general which can be found at www.silo.net and in particular a talk he gave in Peru in 1989. Presence of Humanist Party of India at India Gate, Delhi, 09 Apr 2011. The HP members Sudhir & Saket participated in the rally from Jantar Mantar to India gate and then the celebrations at India Gate with a passionate and peaceful crowd of a few thousand people. The whole environment was like a celebrations, with happy, satisfied, confident faces all around. People seem to have regained faith in life and they were vibrating with energy, talking positively about the power of non-violence and the need of using non-violence as the method of struggle against crisis. 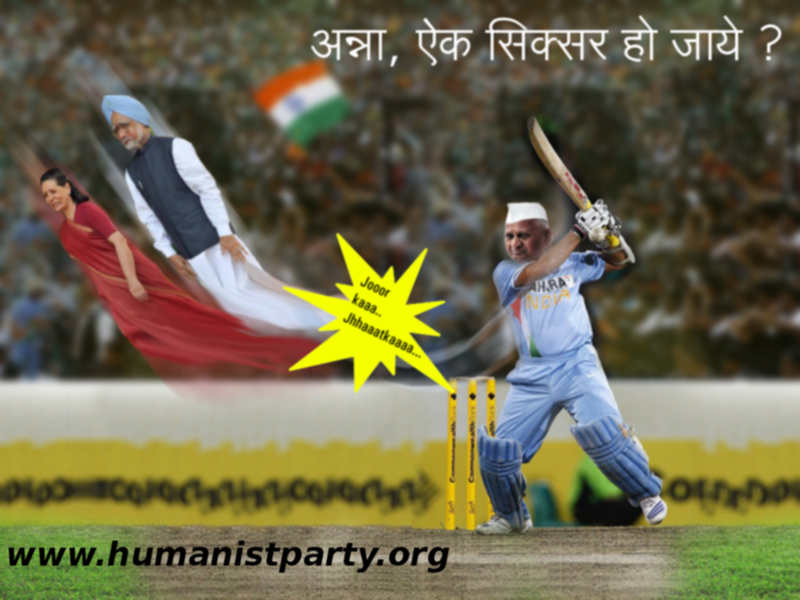 Our banner showing Anna Hazare's cricket-shot (that blew away the Prime Minister Monmohan Singh and Congress President Sonia Gandhi) became an instant super hit with people who saw it. Everyone wanted to take a picture of the banner, then a picture of banner with themselves in it. Then, as we reached India gate, media came after us one by one and in groups, taking video of the banner and asking us brief question about the theme of the banner. Our explanation: "When the non-violent honest people start playing cricket, the corrupt ones will be thrown far away than the seas of India". Hundreds of people took pictures of the banners with us and the theme became the super hit theme among the people there. This was very encouraging for us also and showed us a new way to reach people. Lets have some home grown Cricket now ! Since 2008 the vast majority of the Western population dream about saying "no" to the banks, but no one has dared to do so. No one except the Icelanders, who have carried out a peaceful revolution that has managed not only to overthrow a government and draft a new constitution, but also seeks to jail those responsible for the country's economic debacle. Last week 9 people were arrested in London and Reykjavik for their possible responsibility for Iceland’s financial collapse in 2008, a deep crisis which developed into an unprecedented public reaction that is changing the country's direction. It has been a revolution without weapons in Iceland, the country that hosts the world's oldest democracy (since 930), and whose citizens have managed to effect change by going on demonstrations and banging pots and pans. Why have the rest of the Western countries not even heard about it?